Option #1: Bus trip + tailgate. This option gives you access to a pre-bus ride tailgate party at Major Goolsby's and a round trip bus ride between Major Goolsby's and Lambeau Field. Option #2: "The Whole 9 Yards"
The whole 9 yards includes a round trip bus ride, access to a tailgate party at Major Goolsby's before the bus ride to Lambeau Field, and one endzone ticket to the Packers game. We all know that driving to Lambeau Field from Milwaukee can be a hassle, especially for games that are in the evening. 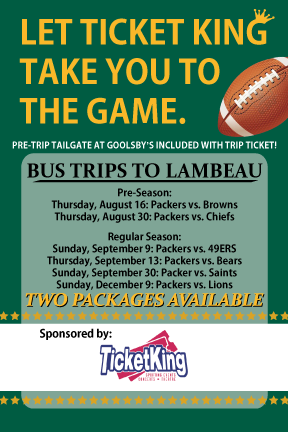 Leave the driving to Ticket King Milwaukee and enjoy a hassle-free trip to Lambeau Field. Go Pack Go!